Here is the main stage decoration! Cindy and I waiting for the excitement to begin! This year’s exciting theme: Making a Difference for 25 Years! we were delighted to hear CEO and cofounder, Shelli Gardner, share the story of Stampin’ Up!’s humble beginnings. Shelli and her sister, Vonna, never thought that their tiny rubber stamp business would one day become a company with a global reach, employing 500 people, and able to make a difference in the lives of people all around the world. 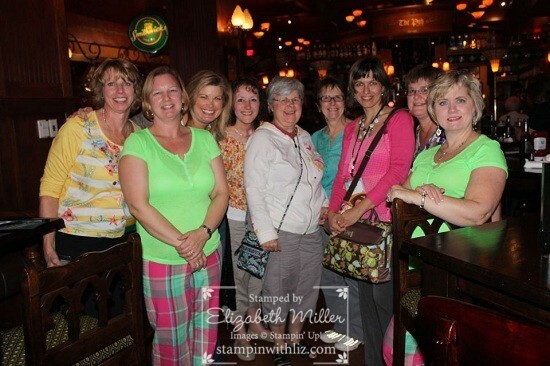 Said Shelli: Stampin’ Up! was created to meet basic financial and social needs. With those needs met, it was then possible to reach out and make a difference in the lives of others. She marvels, now, as she sees demonstrators worldwide doing exactly the same thing: making a difference in the world around them as a result of their involvement with Stampin’ Up! A few new kits were announced and showed how versatile Stampin’ Up! kits can be, and rolled out the Dude, You’re Welcome kit–designed for men who normally wouldn’t be caught dead stamping! It was a huge hit. Dudes or not–we all want it! Click here to read more. Bonnie Thurber unveiled the Paper Pumpkin –a brand new monthly subscription program designed to capture those potential customers who want to craft–but don’t want too much “stuff.” As Bonnie said, Paper Pumpkin will be the magical means by which these customers can experience 30 minutes of creativity–delivered right to their door. Kits will be available for $19.95/$24.95, including shipping. Click here to read more about the new Paper Pumpkin program! Lunches provided at Leadership are plated and you sure feel special. We ate the best pub food for dinner! We ended our evening session, with the biggest pajama party Orlando has ever seen!